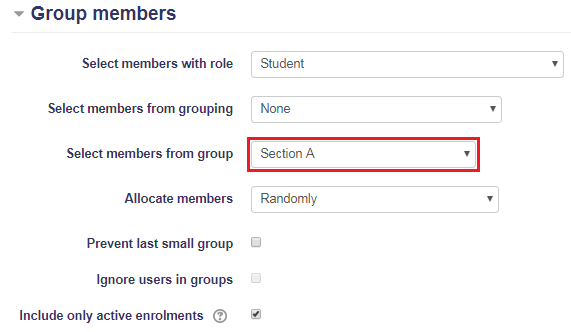 You can automatically create subgroups of groups in your Moodle course. This is most commonly used to create discussion groups for online courses that have more than one section. To create discussion groups for a particular section of a course, do the following. In the Administration block on the left, click Users. More options will appear. Click on Groups. Here you will see a list of all of your section groups. Under this list, click the orange Auto-create groups button. Naming scheme: In this example, my first section is called Section A. In the "Naming scheme" field, I entered Section A Discussion Group #. The discussion groups that are auto-created will be called Section A Discussion Group 1, Section A Discussion Group 2, Section A Discussion Group 3, etc. If you would like the groups lettered (e.g. Section A Discussion Group A, etc. ), you may simply exchange the '#' for a '@'. Auto create based on: Specify whether you would like to create the subgroups based on the number of "Members per group" or "Number of groups." Group/member count: Designate the number of members or groups. Under "Group members," go down to "Select members from group" and select the name of the section that you are creating discussion groups for. Or, you may select the group that represents the entire class. Under "Grouping", for the "Grouping name," you can select the appropriate grouping or create a new grouping. If you want to create a grouping of the groups you just created, you may use the same name as you did for the "Naming scheme," but simply take away the # sign and add 's.' In this case, it is Section A Discussion Groups. In other cases, you may want to use a more generic grouping (like Discussion Groups) and then place each section's discussion groups into that same grouping. Repeat this process for each of your sections.